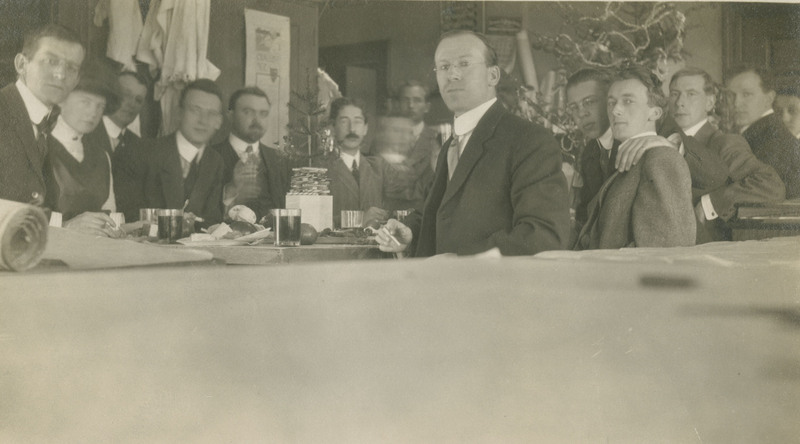 This is the Cram, Goodhue and Ferguson office Christmas party in December, 1909. The Boston architectural firm had been hired by Rice Institute President Edgar O. Lovett in the late summer of that year to design a campus development plan and begin schematic drawings for the first buildings. I think Ralph Adams Cram is on the far left. The only other person I can identify here is the fellow with his friend’s arm over his shoulder, looking directly at the camera–William Ward Watkins. Wow. They are much younger than I expected. That’s a good point. I’ll look up how old they were. And a woman architect at the firm (second from left)?